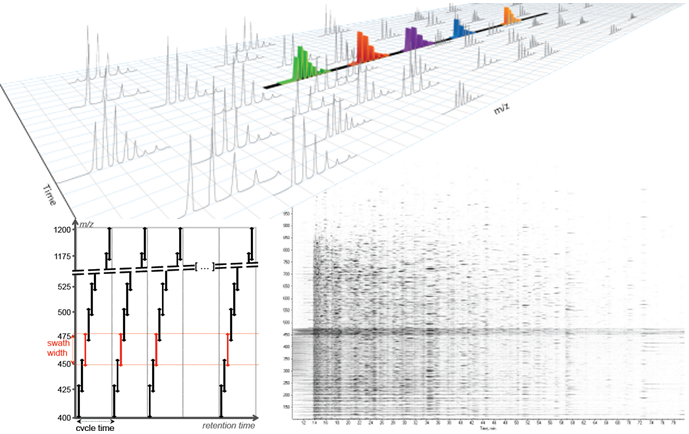 SWATH is a new data-independent technique in mass spectrometry that allows the collection and storage of the fragmentation spectra of virtually all peptides in a sample. A m/z range, generally 400-1200 Th, is divided into a number of swaths or bins, typically around 15 Th wide. The spectrometer cycles through these bins, and fragments all precuror ions that fall into the current bin, and collects the (very complex) fragmentation spectra. Once it has stepped through all the bins, it starts again with the first bin; cycle time across all bins is typically 2-4 seconds. The collected spectra are then interpreted with the help of software such as OpenSWATH or Peakview.